In my house flossing has always been a tough habit to start for my kids. They will do it if I am there to constantly remind them, otherwise I get the "I forgot" line when I ask later. Mostly I think it's been an out of sight out of mind thing since the floss is in the drawer and sometimes gets pushed to the back or covered up. And some is just that it's another step they don't want to take the time to do. So as a parent we have to get creative sometimes to encourage them to do the things that are not only necessary, but good for their health too. With Plackers® Flossers now on hand I've actually seen my daughter flossing on her own without the reminder more than ever before. She has a cute little monkey shaped Flosser Friend™ that sits on the bathroom counter that reminds her to floss after she brushes. I love it because the flossers are completely inside the holder so they stay clean, yet the monkey reminds her because it's sitting out in plain view. She said she likes that and that the flossers have a good flavor to them not plain wax. 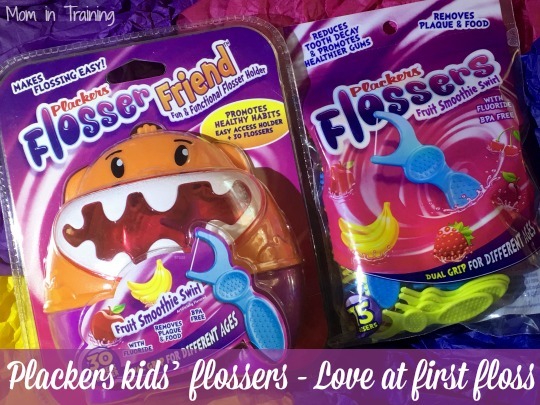 Plackers® helps kids develop healthy dental care habits with Fruit Smoothie Swirl Kids’ Flossers. The fruit smoothie flavor is one that kids like and will encourage them to floss every time they brush. I know in my house it's helped already! The new, brightly colored flossers are designed with an angled head, allowing kids and parents to easily reach all teeth. Plackers’ Hi-Tech® floss is engineered not to stretch, shred, or break, and includes fluoride to promote strong teeth and reduce tooth decay. The kid-friendly fruit smoothie flavor is sure to be a hit and helps make flossing a fun – and tasty – task. Plackers enhances the overall flossing experience for kids with its new Flosser Friend™. The adorable monkey-shaped flosser holder is meant to amp up the fun factor and help kids look forward to flossing. Not only is the flosser holder a cute way to store kids’ flossers and keep them close at hand, its flip-up cover design allows kids to easily access their flossers. The Flosser Friend is easy to open and clean, and comes pre-packaged with 30 dual grip kids’ flossers. Plackers new Dual Grip Fruit Smoothie Swirl Kids’ Flossers and the Flosser Friend are available at Wal-Mart stores nationwide and other retail stores such as Publix, Safeway and www.target.com. Win it: One lucky reader will win a Flosser Friend™ (monkey-shaped holder with 30 kids’ flossers). This giveaway will end May 4th at 11:59 PM EST. The winner will have 24 hours to respond to my email. If no response, a new winner will be chosen. Prize fulfillment will be made by the sponsor, I am not responsible for prize delivery or lost or stolen deliveries. Open to residents of the US. My son used to mirror me when I brushed. As long as I kept brushing, he kept brushing! We have a toothbrush that has a light that shows kids how long they should brush for. They love it. I always just made it part of the nightly bedtime routine. One tip is to just make it part of the nightly routine! That way their mouth will feel gross if they forget to do it! I let them pick out their own brush/flosser so it gets them interested in brushing. I use fun flossers like these! I let my kids pick toothpaste flavors that are more fun than the usual mint. These look so fun! My kids like to floss but I think they'd definitely remember if they had these! We have a few made up silly word songs. They seem to be hilarious but we only sing them while brushing. We have a few of our favorite songs on my phone, and we always play one to brush too. He loves moving around to the music and brushing! I use a timer which my daughter likes to make it more fun. I buy those flashing timer and make it a competition among them - whose has the whiten teeth. I would say to pick out toothbrushes and floss that they like to get kids to do it on their own. I brush my children's teeth, I sing songs and have used tooth brushing apps. It is part of our nightly bedtime routine, my kids enjoy doing it because they don't want cavities that could lead to having to get a tooth pulled. We sing a song and do a little dance while brushing our teeth. My kids have been brushing and flossing since they had their first teeth so it has just become habit for them. They have better flossing habits than I do! Let them pick out their favorite color or character toothbrush to encourage brushing.